The Employees Provident Fund (EPF) has entered into a second partnership with Eco World Development Group Bhd (EW Bhd), this time to jointly develop 2,198.4 acres in Ijok, Kuala Selangor, comprising the recently-launched 1,400-acre Eco Grandeur integrated township and Eco Business Park V.
In a statement, Eco World said the retirement savings fund would subscribe to 40% in the enlarged paid-up capital of EW Bhd’s unit Paragon Pinnacle Sdn Bhd, the developer of the leasehold land. Under their subscription and shareholders agreement signed on Tuesday, EPF will also provide shatreholders advances of RM367mil to the joint-venture company to fund the developments. EW Bhd, through a wholly owned subsidiary, will be appointed as the development manager for the projects which will be marketed as Signature EcoWorld developments pursuant to development management and brand licence agreements to be entered into with Paragon Pinnacle. “The subscription and shareholders agreement signed today is the culmination of months of hard work to arrive at a truly win-win partnership for both parties,” said EW chairman Tan Sri Liew Kee Sin. The first joint venture entered with EPF was to develop the Bukit Bintang City Centre project on the former Pudu Jail site. The project owner is BBCC Development Sdn Bhd, in which EW Bhd and UDA Holdings Bhd have a 40% stake each and EPF the remaining 20%. 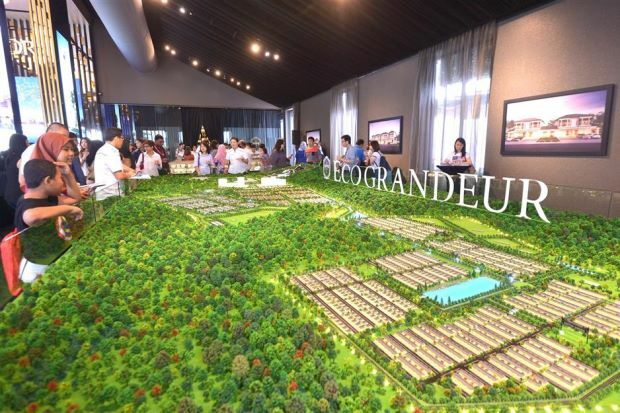 Eco Grandeur, launched on Sept 25, was reported to have a gross development value of RM8.58bil. For its first launch, Eco Grandeur offered the Graham Garden terraced homes and the Avenham Garden homes. Graham Garden consists of well-designed 20ft by 65ft terraced homes with starting prices below RM500,000 while Avenham Garden offers unique 30ft by 60ft garden homes priced around RM650,000. Response was overwhelming with an 81% take-up recorded of the 830 units opened for sale on launch date. Eco Business Park V, meanwhile, will be launched next year and Eco World will adapt the most successful concepts it has pioneered in Iskandar Malaysia to cater to business owners and industrialists in the Klang Valley. EW Bhd said the group had so far launched three successful business parks in Iskandar Malaysia. “We are confident that Eco Business Park V will be extremely well-received,” said EW Bhd president and chief executive officer Datuk Chang Khim Wah.